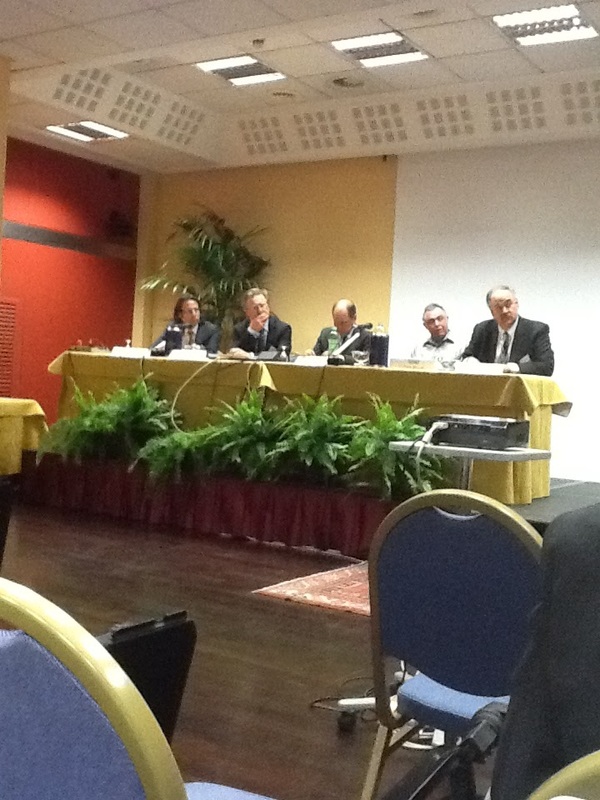 Today I attended the MDA forum 2012, organized by Soluta.net and held in Milan, Italy. The topic of this year has been: “BPM and MDA”. WebRatio was sponsoring the event and also had a presentation during the day, given by Stefano Butti. Here is a short summary of the day, which has been extremely interesting and fruitful. The reason why we need modeling is the huge amount of information we need to deal with. CIOs today have a complete separation between where they are today and where they expect to go: they now mainly focus on hardware, printing, networking; but their view for tomorrow is towards cloud computing, BPM, Enterprise Architecture, SOA. CIOs now feel to have duties outside of core technology, towards addressing problems of enterprise-wide strategy definition. The appalling thing is that most of the discussion is about aligning IT and business. But this is a false problem. According to Zachman, “business” should lay out the enterprise architecture. But since they don’t do it, IT must come in and do it. The challenge is to embrace change and manage complexity. You need to build standards for letting people talk. There is no way of enforcing ONE standard for one problem: every time we try to build the sole, best standard, we are just adding up another one to the existing list. And existing standards don’t go away. The current enterprise challenges are BPM and model-driven design. BPM is the key to agility. One of the main mistakes of enterprise architects is to focus more on technology than on architecture. If we start solving a problem from green field by involving a diverse team, we probably end up with a plethora of different pieces. The result will not be so good and will comprise several different pieces. At this point we need to put them together, and thus we need to define connectors, converters and so on. This requires more people, who will build yet more diverse converters. This ends up in a repeating paradigm that repeats itself forever in a fractal way. unscalable approaches (green) or of enterprise architectures (blue). 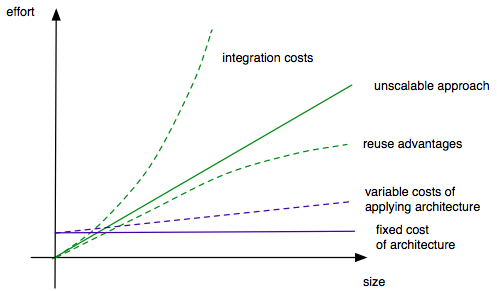 The cost of implementation, ideally linear for unscalable approaches, is actually higher due to integration costs, but can be reduced due to reuse costs. The cost of an architecture is fixed instead. There are only some variable costs (quite low) for applying the architecture. In an architecture there shall be a number of periodic tasks that are started regularly; a number of event-driven tasks that start in response to events; and a periodic control over this. Enterprise transformation is a long journey. You can decide to build your future or to let others set it for you. Standards play a huge role on this. TOGAF is one of the most known and used standards and guidelines for EA. The crucial point is that you cannot only focus on EA, you need to know and integrate Organization Design. You deliver synergies, technology and business performance improvement. Interesting enough, in the last years there has been a fall of 50% of the requests of UML expertise in job postings. On the other side, we see an increase of 100% of the expertise in Enterprise architecture. MODAF and TOGAF and all other architecture framework have some interesting hook where to fit in the modeling practices, but then they keep neutral on what MDE tools and languages to use. This is however a limitation, because I would like to have a clear set of guidelines for that. On all these aspects, MDA and MDA transformations come to help. The framework can be personalized by applying the right model-driven tools. There is perfect complementarity and the two worlds should be brought together. The world is becoming flat again: people and companies are connected throughout the world in a seamless way. Value streams become virtual: there are processes that are virtually the same in every organization, and thus it makes sense to model and extract them and make them unified, or possibly even externalized. Dynamic value chains, applied to industrial production so far, is now ready for the service industry (see the book: “This is service design thinking”). Of all the innovation forms (product, process, technology,… ) there is one that has much more potential: business model innovation. This requires to map what you are, make sure you are complete and identify your core strengths. All this leads to component-based thinking. This is a major key to be lean and agile. Enterprises must become outside-in, focusing on bringing knowledge in from outside (e.g., crowdsourcing). About the role of IT in the future, Soley thinks that IT by itself will disappear in the short term. Decision makers will blend all the aspects together and IT will be distributed throughout the organization. Other important trends will be automatization, externalization, outsourcing, commoditization. The business will drive the IT changes in the future. Transformation is the real challenge, and now it’s easy to motivate customers by highlighting how they are left behind by competitors if they don’t change. Small companies have more to gain by adopting MDE, because of the increase in productivity. However, there is a skill gap to cover for that in the workforce. In his presentation, the first of the afternoon, Stefano presented our experience with WebML and WebRatio and outlined the roadmap to the standardization of the new IFML language (Interaction Flow Modeling Language).